Marshon Sanders, a 17 year old senior at Highland Park High School in Chicago's northern suburbs, took part in the school's tradition of wearing costumes on Halloween. 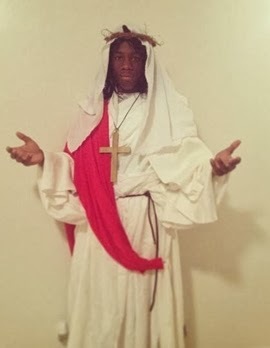 But Sanders was removed from class after two teachers complained that Marshon was dressed like Jesus Christ. After being dismissed from class, school administrators deemed his costume as being potentially offensive and violating the dress code policy that no costume should "be offensive or perpetuate a stereotype of someone's culture, gender, sexual orientation, heritage or religion." At first, Marshon was told to remove his large pectoral cross. Later, Sanders was instructed that in order to return to class, he needed to remove his white robe, red sash, cross and head scarf. Highland Park High's Director of Communications Melinda Vajdic stated that the costume could be interepreted as poking fun or perpetuating a "religious stereotype". Vajdic further pontificated, "Costumes trivialize. I’m sure that wasn’t his intent, but we want to maintain a culture of mutual respect.” But surely this same condescending standard should have applied to students costumed as Mormons, Moses and priests. Before Marshon went back to class, the student contacted his mother. Angela Frison urged her son to wear a costume that was uplifting and approved of his choice. Some might say that Frison's son was doing All Hallow's Eve right. Marshon chose the figure who was most important to him. When Ms. Frison asked the school dean what was so offensive about Marshon's costume, she was not given a direct answer. Frison thought that those teachers who were offended might have been due to the notion of a black Jesus. After the ad hoc Parent-Teacher meeting, the school seems to have changed its tune with the prospect of bad publicity. The administrators reconsidered and ruled that Marshon was not being offensive and gave permission to wear his outfit but the chagrined teen declined. The school later put out a press release in the afternoon confirming that Marshon had been told that he could wear the costume. 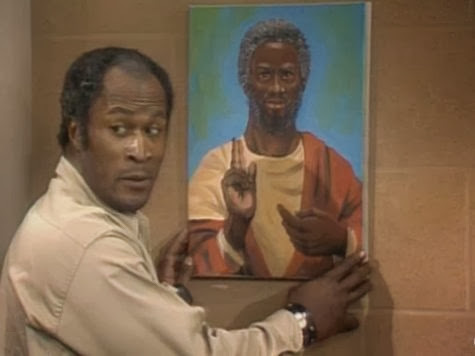 Nearly 40 years ago, the show Good Times, set in the projects in Chicago (implicitly Cabrini-Green), created controversy over a depiction of a black Jesus. It would be a pity if Norman Lear's polemical plot still holds sway in enlightened north shore of Chicago-land. While race might be the case, a concurrent stream of influence is a fanatical secular political correctness which aims intensely upon Christianity . There are so many stories of public schools bowing at the altar of political correctness and harboring an acute sense of Christophobia. Consider cases where children are sanctioned against reading the Bible during lunch. Or valedictory speeches that must be censored so as not to mention Jesus. So it is not surprising that teachers would be skittish about a positive portrayal of Christ in the schools, even on Halloween. For Halloween costumes, the Priests and Mormons get-ups certainly could have satirical or salacious connotations, but depicting the Messiah might have been too positive of a Christian costume. And such a positive Christian influence, even coming from a student would not be kosher, so to speak, when trumpeting multi-cuturalism that is non-judgmental, except for traditional Judeo-Christian mores.